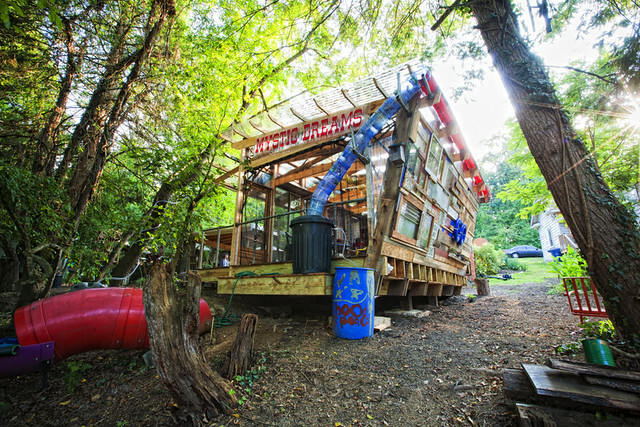 In Asheville, N.C., a small city in the Appalachian mountains, creativity abounds, and so does the need for community transformations. With its beautiful mountain setting and vibrant downtown, Asheville has quickly become a popular destination, drawing visitors and new residents from all over the country and the world. People are drawn to the creative energy flowing through the city's music, art and food. A recent post about grassroots creativity effectively highlighted the need for a "hidden catalyst," embedding artistic values within local communities to help cities place themselves competitively in the global context. Yet true grassroots creativity should go beyond helping a city compete globally; it should activate and cultivate local resources. In Asheville, the concept of "local" is all the rage, whether it is eating, buying, growing or building. Yet some of its most local resources — people that have lived and called Asheville home for generations — have often been overlooked. Beyond the galleries, art studios, storefronts and restaurants, the creative spirit is alive and well, engaging local communities in a collaborative effort of social change and transformation. 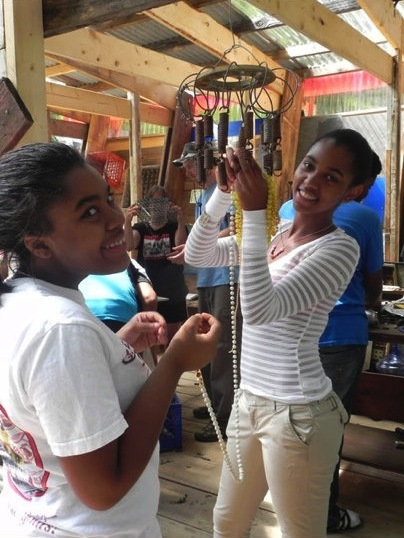 One such place, the Burton Street Community, has been working creatively to transform discarded objects into art, neglected properties into community spaces, and at-risk youth into creative catalysts for change. The Burton Street Community, founded in 1912, was a thriving black community that gave rise to prominent leaders, a successful agricultural fair and a minor-league baseball team. In 1960, the neighborhood was bisected by the building of Interstate 240. Since then, it has dealt with abandonment, disinvestment, drugs and crime. Throughout these hardships, a strong and active community has persisted. In 2008, faced with the threat of losing 20 more homes as a result of the expansion of the same highway that decimated it half a century before, the neighborhood became proactive. Instead of letting outside forces dictate their future, they decided to define and create the community they wanted to live in — and make it happen on their terms. Through a partnership with the Asheville Design Center (ADC), a local non-profit community design center, the Burton Street Community developed a neighborhood plan to help articulate and define their future. Residents wanted to ensure that their neighborhood would remain intact, diverse and affordable. They also wanted to activate and support existing resources, such as vacant land and local youth. Dewayne Barton, a community leader, activist and artist, is working to ensure that as the neighborhood improves, so will the people who call it home. Barton and his wife, Safi Mahaba, a community activist and gardener, bought four adjacent properties in the neighborhood and developed the Burton Street Peace Garden. 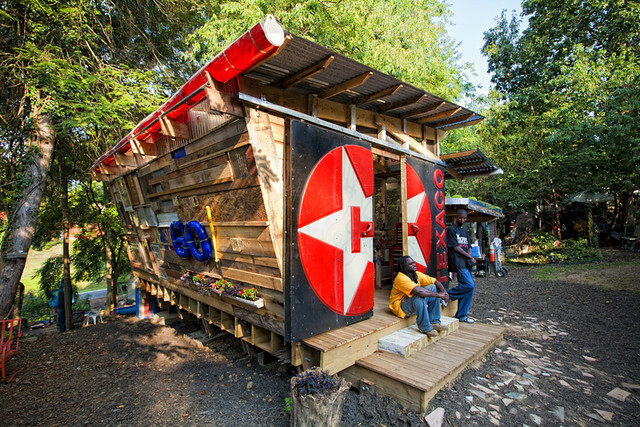 They have slowly been transforming these spaces, which were covered with weeds, discarded alcohol bottles and syringes, into productive spaces cultivating art, food and environmental justice. The Peace Garden holds a collection of pieces constructed from waste Barton picked up on the streets. The pieces confront a range of issues, including corporate power, media, gentrification, race and the military-industrial complex. Inherent in each of the pieces is a critique about waste and consumption in our society. The Peace Garden has been transformed through the hard work and energy of local youth. Many youth from the neighborhood face the constant challenges and draws of the street, where money can be easy, diversions many and futures spent locked up. 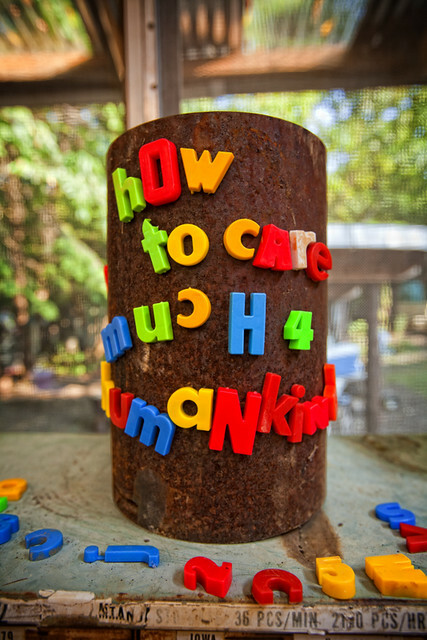 Barton describes the need to “hit them hard when they are young,” challenging them to think differently about the world around them. The Asheville Design Center was committed to taking neighborhood plans beyond printed documents that collect dust. 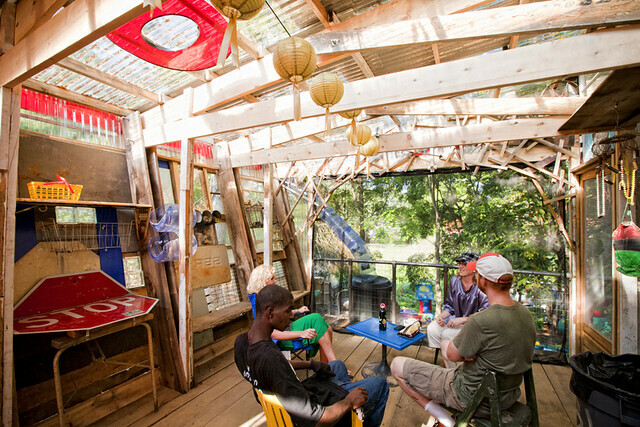 In 2011, with North Carolina State University as a partner, the ADC developed a 10-week summer design-build studio to provide physical spaces that meet the needs of partner communities. The inaugural project was an interactive teaching and learning space in the Burton Street Peace Garden. 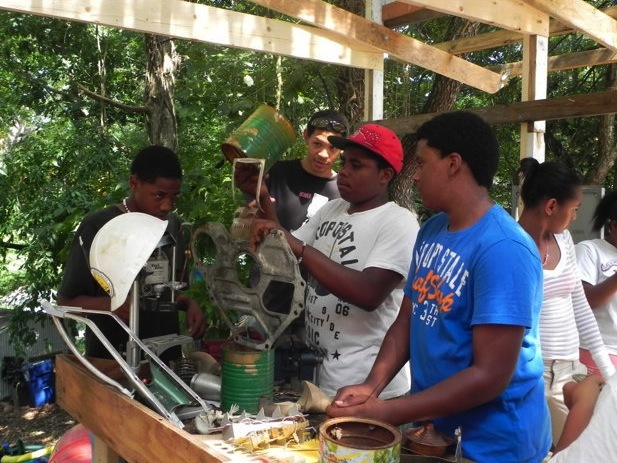 The goal was to provide a space where youth could learn about environmental and social justice through hands-on application. 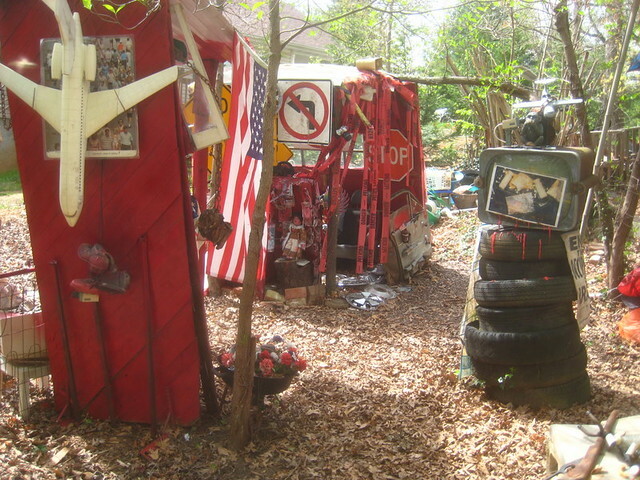 It was Dewayne’s vision to create a space where people could transform useless junk into art and functional objects. As a result, the structure needed to embody the notions of recycling and reuse, but also serve as a work of art, influenced by the spatial, tactile and artistic conditions of the garden itself. The studio brought together five students from three regional universities (North Carolina State, Appalachian State and Virginia Tech) with architecture, landscape architecture and construction management degrees. 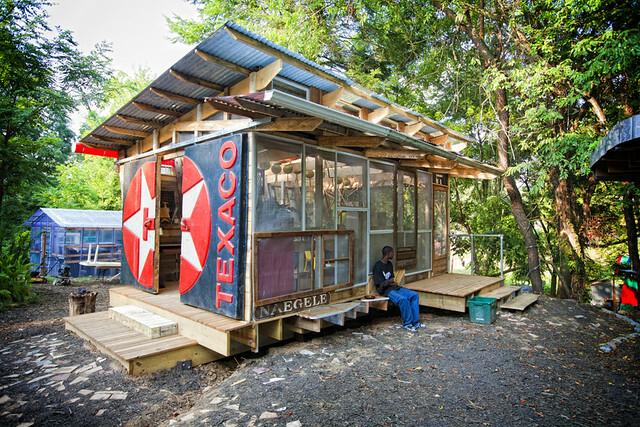 During 10 weeks, the students, with help from community members, developed the design and completed the structure, for a total cost of $3,900. 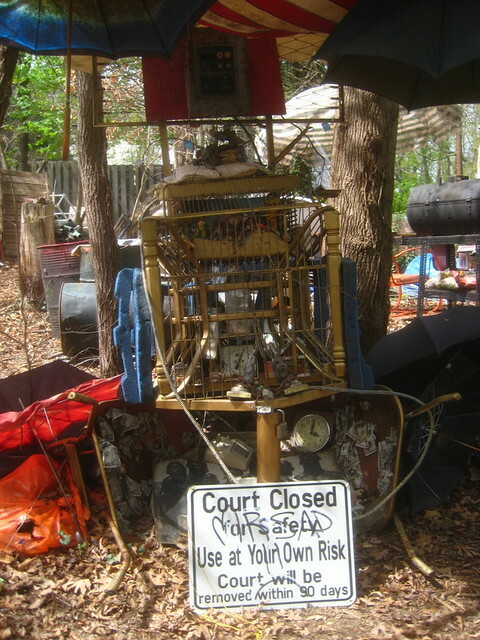 Much of the material for the structure came from the site itself, where there were stockpiles of discarded objects that Dewayne had slowly been collecting. For the design, the students developed a structural framework that was clearly defined and let other elements (skin, furniture, water collection) evolve through the construction process. The skin of the structure is defined differently on each of the four sides, based on the variety of site conditions. The north and west sides were enclosed because of their proximity to private houses nearby. 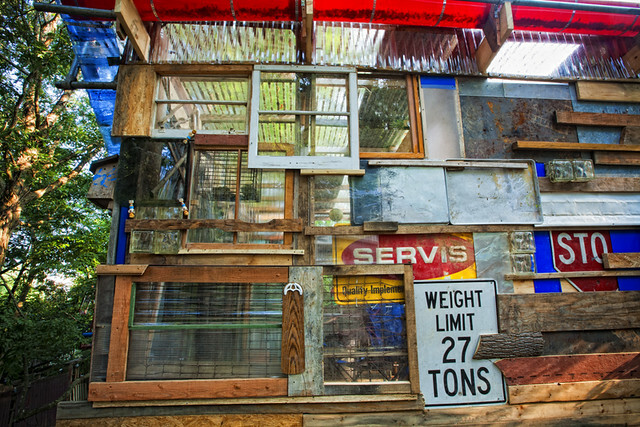 The north wall is a canvas of material composition, utilizing wood, metal and glazed materials, while the west side is defined by a large, discarded Texaco sign that was transformed into a sliding door. The south and east sides were left open to connect to the rest of the garden. The south side is protected from mosquitoes by a collage of old window and door screens, while the east side is open, almost in the trees. At the top of the opening is a discarded sign that says “Mystic Dreams,” which fittingly became the name of the structure. On the inside, work spaces are created from ironing boards and street signs. Natural light and views are created through a range of materials, including translucent roofing, glass blocks and old windows. 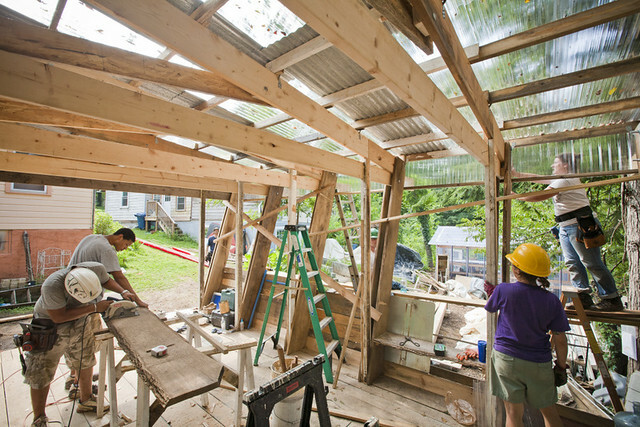 The built-up frame structure is made of a range of salvaged wood materials, including 2x4’s, engineered 2x8’s and locally milled 2x12’s. Beyond material reuse, environmental stewardship is activated through the collection of water. The main gutter is made of red translucent sign vinyl. As water runs down the gutter, it can be viewed from inside the structure. The water is then channeled through water cooler jugs into a cistern and can be used to water the vegetable gardens or power the water slide (built from an old McDonald’s playground), which then flows into the gardens. Through this setup, water can be seen, heard and felt. Faced with mounting economic challenges, over-consumption, environmental degradation and growing poverty rates, places such as the Burton Street Peace Garden challenge us to find value in all types of resources. When creativity goes beyond jockeying to position ourselves in the global context, it can be harnessed in a way that challenges young thinkers to create a community, city and world they would like to see as their own. Luke W. Perry coordinates the Asheville Design-Build Studio and is an adjunct faculty member at Appalachian State University in Boone, N.C. Credits: Photos 1, 4-8, 11 from Michael Oppenheim. 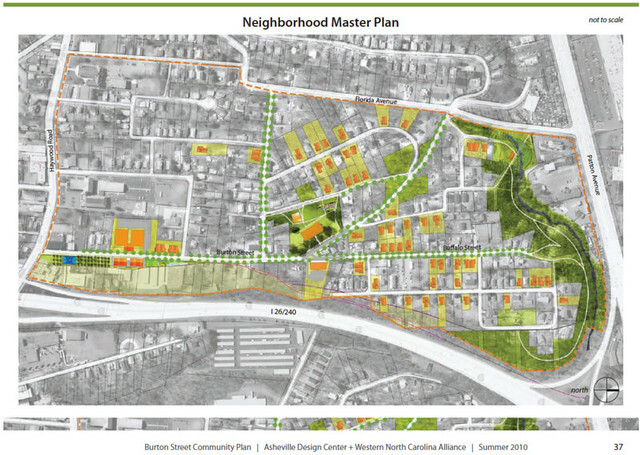 Photo of Burton Street Neighborhood Plan from Asheville Design Center. Photos 2-3 from Luke Perry. Photos 9-10 from Cailin Edenfield. What an amazingly inspiring story. Thanks. It seems to me that one of the lessons Asheville teaches is that we all CAN "be" the change -- it takes a lot of creative growing on everyone's part, but it's possible. I like to think that this is an idea whose time is coming - soon! I think you can stick whatever you want on the structure. The base of the structure is just a storage shed. Wow. Such an amazing and inspiring story. Thanks for sharing.